We offer complete range of spray on concrete hardener and anti-dusting treatments in United Kingdom, Australia & New Zealand. Concrete hardener and concrete anti-dusting treatments is an area MARKHAM GLOBAL specialises to help concrete achieve long-term durability. 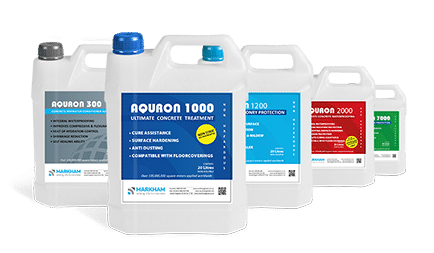 MARKHAM GLOBAL supplies the full range of the AQURON penetrating concrete hardener, concrete waterproofing and concrete curing in one treatment. MARKHAM also have a full range of Sodium silicates and lithium concrete hardeningfor floors & precast walls. The difference between the AQURON Penetrating concrete hardener is that it provides a curing and hardening combination two in one application product compared to Sodium Silicate and the Lithium Silicate concrete hardener that are surface hardener only. Lithium Silicate version does not require to be scrubbed following the application.